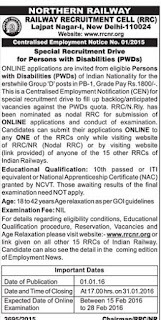 Railway Recruitment Cell (RRC) Northern Railway Recruitment 2019 News: Check RRC Recruitment 2019 online in coming months, till you can view old orders. 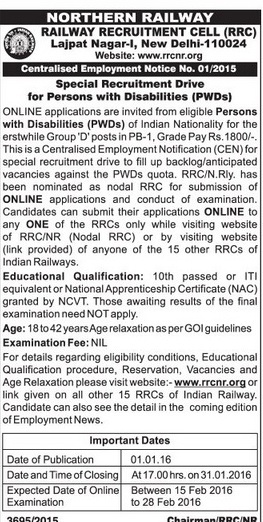 This year Railway recruitment cell (rrc) of northern railway invites online applications for various posts. 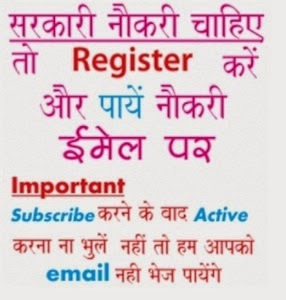 The official notifications for these posts is provided at website at rrcnr.org. Interested and eligible applicants have to apply online on or before as per official schedule and tentative date of display merit list for these posts in 2019. The far more information of Northern Railway Recruitment 2019 regarding salary, eligibility and application process etc is mentioned below......................................... Schedule of Recruitment process i.e. Date of ONLINE written examination (08/03/3019) and for Assessment of Talent & Document Verification (18/03/2019) against Cultural Quota notified vide Notification No. RRC/NR 04/2018/CQ is hereby withdrawn on Administrative grounds. Further information will follow shortly on this website. MECH. (W), S&T (W), ENGG.